The basic effect as seen by your spectators is that you can read minds and see through the cards as if you had X-ray eyes. 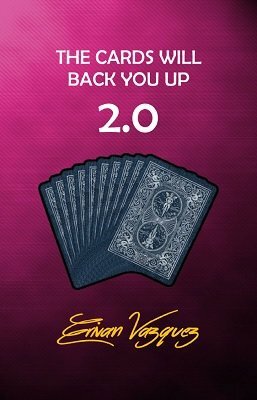 This is an updated version of the first publication of The Cards Will Back You Up . In this new version you will find some corrections that were made due to the fact that the version described in the first edition did not work one hundred percent of the times. With the "new" (or corrected I might say) method, the effect works always. It has been put to test a lot of times before writing it (so we can avoid a third edition) with one hundred percent of accuracy and success. There were some improvements made and you will be able to perform an additional effect prior to this one that will set up your deck on the go, which compared to the previous version, this time the effect can be considered as impromptu. 1st edition 2017, 8 pages. With this trick you will be able to read your spectator's mind and also to see through the cards just as if you had X-Ray eyes. EFFECT: You show a well shuffled deck of cards, but just to make sure that there is not any type of arrangement, both you and your spectator shuffle it more. He gets half of the deck and you take the other half. When everyone is satisfied that the deck is really mixed, the deck is assembled. You now ask your spectator to cut the deck into three about equal piles. He takes one portion while the other two thirds are put together and set aside. Then, your spectator shuffles his packet or he can simply cut it just as many times as he wishes (it's up to him) and as soon as he is done shuffling (or cutting), he looks at the bottom card of his packet and remembers it. Next, he places his packet on top of the remaining of the deck and squares it. Finally he shuffles one more time and makes one last cut. After he is done with all this procedure, you, without asking any question and without even looking at the faces of the cards, proceed to read his mind and with the cards spread face down on the table you pull out the correct card without failing. 1st edition 2014, 10 pages.